Another day, another devaluation for the Chinese yuan. But investors are not freaking out like earlier in the week. 1. All eyes on China: The Chinese currency dropped again versus the U.S. dollar, but the central bank is rushing to calm fears about the yuan's more than 3% tumble over the past three days. The central bank said Thursday that it expects the currency to stabilize, and that circumstances no longer call for continued depreciation. China's government has in the past tightly controlled the yuan, but now it's trying to allow market forces to play a larger role in setting the value of the currency. 2. Stock markets rebound: The yuan's recent, unexpected moves frightened traders. Many hit the "sell button." But now people have calmed down. 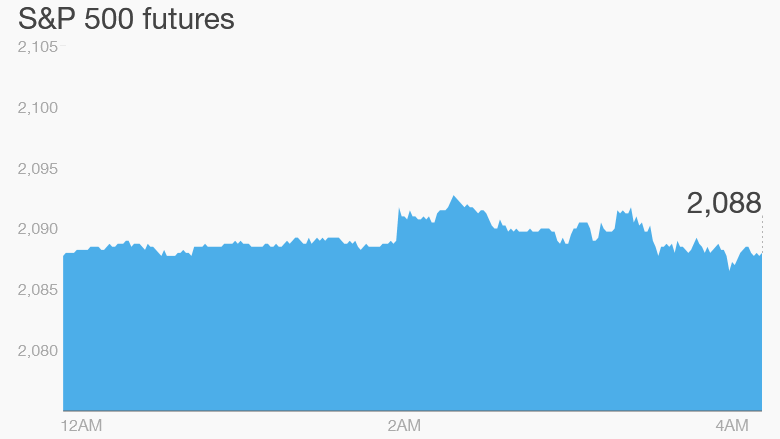 U.S. stock futures are pointing up Thursday. European markets are making big advances in early trading and all Asian markets closed with gains. "Fears of [a] Chinese economic meltdown appear to have been allayed for the time being," said Augustin Eden, a research analyst at Accendo Markets. The latest reading of the CNNMoney Fear & Greed Index shows investors are still feeling extreme fearful, though the mood has improved a tad from Wednesday. Related: Devaluation, deflation and death crosses! Oh, my! 3. Earnings: Kohl's (KSS), Dillard's (DDS), Coty (COTY) and Nestle (NSRGY) are reporting earnings before the market opens. This afternoon, a handful of companies, including Nordstrom (JWN), will report after the market closes. 4. Stock market movers -- News Corp. and Cisco: Shares in News Corp (NWS) and Cisco (CSCO) are expected to surge by about 4% at the open on the back of well-received earnings, which came out Wednesday evening. 5. Economics: Retail sales data for the month of July will come out at 8:30 a.m. ET. Also at 8:30 a.m., the U.S. Department of Labor will release weekly jobless claims numbers.